Yuzhno-Sakhalinsk, an island in the Pacific, North-West of Hawaii. Yuzhno-Sakhalinsk. This name sounded to me like some inaccessible place in the Russian Far-East. So when I was offered to go to Yuzhno-Sakhalinsk in the midst of the wintertime, I recalled my principle of always being ready for new experience, and never refusing a good offer! 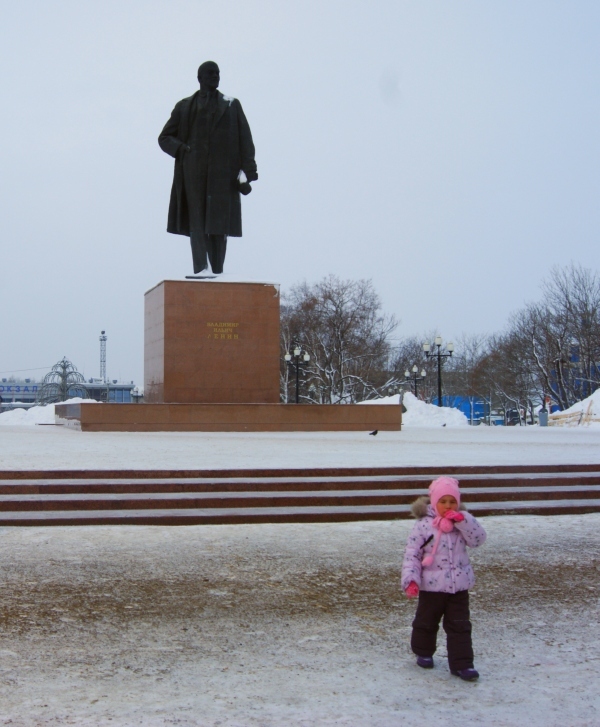 I first looked at Yuzhno-Sakhalinsk on a map to found out where it is. Yuzhno-Sakhalinsk is on Sakhalin Island, in the Pacific, close to Japan’s Hokkaido and Vladivostok, North-West of Hawaii. So Sakhalin is physically closer to Hawaii than Moscow. That’s gave me the idea of this catchy title. The city, situated in a plain, is surrounded by impressive mountains, from which, you can either ski during the wintertime or have a look at the linear shape of its streets. The 2 biggest mountains on Sakhalin are Mt Pushkin (1047 m asl) and Chekhov Peak (1045 m). Yuzhno-Sakhalinsk’s name appeals more to Russian speakers: It simply means the city at the South of Sakhalin island. Its name changed several times throughout the History. In the ancient time, there was nothing in Sakhalin but small villages inhabited by native tribes (Ayny, Nivkhy, Ultas, Oroks …). The majority tribe was the Ayny. These tribes were gatherer-hunters, were small in size, had slanted eyes, like the Japanese people, but with a thick beard. The Ayny were animist and had in common with the other tribe of Sakhalin an interesting worshipping ceremony, the feast of the Bear. They happened to capture a young bear in summer time, they were feeding it for one month, and then they sacrificed him. During this month, the tribe could convene together several times. Sakhalin has been mentioned by the French navigator LaPerouse in the 18th century, but it is the Russians who have explored the island more thoroughly. Because of its remote location, no Russians wanted to settle on Sakhalin on his own will, so the first village there was founded by convicts. As the village grew, it was named Vladimirovka in 1882. It quickly gained the status of the biggest penal settlement in Russia. Until now, the name Sakhalin still make older Russian people shivering, because Sakhalin was considered as a colony of the strongest regime. In 1905, The Russian defeat in the Russo-Japanese War of 1904–1905 awarded the southern half of the Sakhalin Island to Japan. Vladimirovka was then renamed Toyohara from 1905 to 1946. 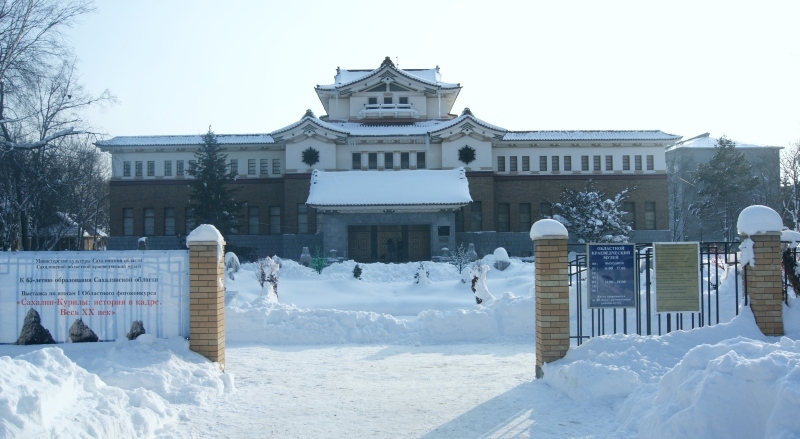 During that time, the Japanese built the governor’s Palace, which is one of the few remaining Japanese buildings in Yuzhno-Sakhalinsk. It works now as the Museum of Sakhalin Island. Japanese also brought a great number of Korean workers that still live there. Some sources state they were brought by force. Today, Yuzhno-Sakhalinsk is the biggest city of Sakhalin and is home to 300 thousands inhabitants. 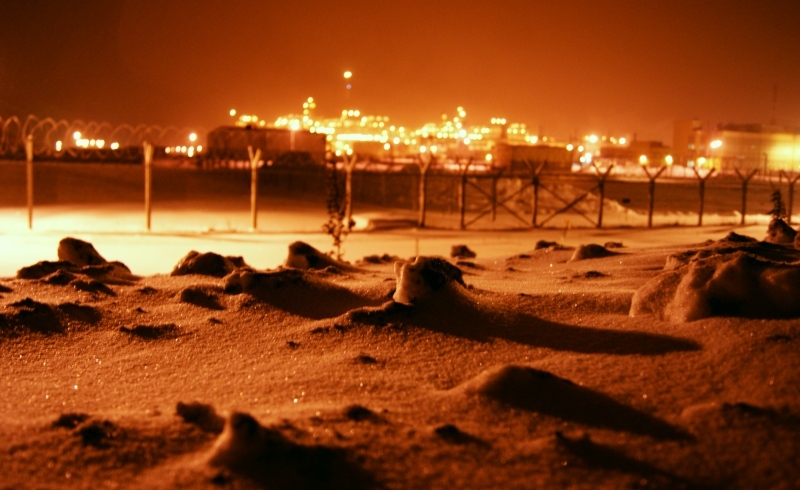 The island economy mainstay is oil. Apart from Russian companies, ExxonMobil and Shell are also present and maintain headquarters and residential complexes in the city. The demand for natural resources by the Japanese, Chinese, and South Koreans has ensured continued profit for the oil companies implanted in Sakhalin, and in return, those companies did significant local investments. However, there has been a lot of criticism towards the local administration. It is said that it is not truly caring for its citizens and instead squanders the oil bonanza away. For instance, infrastructure on the island is almost inexistent. The only railway was built during Japanese rule. The city is cut in two parts by the railway with no bridges or tunnel to cross it. Instead, the city governor has built himself a sumptuous palace a few years ago, when he already had one at his disposal. However surprising it might be for a big city on an island, Yuzhno-Sakhalinsk is situated on the mainland, 25 km from the sea. The closest port is Korsakov, that comprises a container terminal. Next to the port is Prigorodnoye, a complex with a 10 mln tons capacity liquefied natural gas (LNG) plant and an offshore oil loading terminal managed by Shell. A view of the Prigorodnoye LNG Production Complex, the second biggest in the world, after the Bintulu LNG Plant, in Malaysia.